The 2016 financial year is open as the public accounts have start operating today. The announcement was made publicly today at the Vulupindi Haus by Secretary for Finance Dr Ken Nangan in front of the media and two other Deputy Secretaries for the Department. According to Dr Nangan they have decided to open the public accounts earlier this year than usual because of positive financial performance last year of which 2015 financial year was very clean. "All government and state bodies will receive all their warrants from Treasury next week and other government budgeted areas for 2016 such as the TFF funds for schools, DSIP/PSIP funds, grants to provinces as well as disaster relief funds will all be dished-out in the first quarter of this year starting next week," he said. Furthermore, the Governments’ priority commitments in 2015 such as the Tuition Fee Free funds, special intervention programs funds such as the DSIP and PSIP have all been discharged full along with other priority programs for 2015. 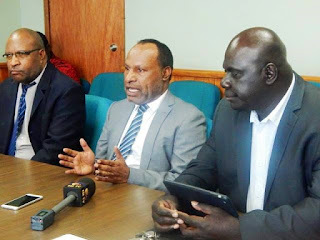 Secretary Nangan made it known that "timing issue with cash flow is an issue as seen and experience last year with delayed in release of DSIP funds but he assures that all these government grants will be honoured and payed out in the first quarter of this year." He says the first lot of TFF funds for schools worth K150million will be paid out this month before school starts. Mr Nangan also thanked the hardworking public servants of the Department of Finance, Department of Treasury and Department of National Planning & Monitoring, for working as a team to do up a clean closure of 2015 account and open 2016 account much earlier than usual.